Interested in the creation, use, management, and of information. Just received notice that Judge Pohl cancelled the two weeks of hearings that were scheduled to start on Monday, April 4. No announcement has been made as to the reasons why at this point. This morning I sat down to begin reading the transcripts from the two-week February 2016 session of the 9/11 hearings in preparation for my work as an NGO Observer at the upcoming April session of the 9/11 hearings. I will be attending week one of the hearings (April 4-9), and a recent alum of IU McKinney Law School will be attending week two (April 11-15). Assuming I did the math right, the two week February 2016 session generated 1453 pages. The transcripts are made available to the public on the Office of Military Commissions website. Simply select the “Cases” tab and open the case you are interested in following. The left navigation panel lists all the available documents for the case, including transcripts. I often refer interested individuals to the Office of Military Commissions page. Reading the transcripts gives the reader a good understanding of why the 9/11 proceedings are an estimated 5 to 8 years from going to trial. For example, on February 17 David Nevin, Learned Counsel (death penalty counsel) for the KSM team, describes the inability to get an interpreter processed through the system so he can join the team. The KSM team has been waiting nearly a year for a replacement after the team’s interpreter was removed without explanation after 2.5 years of service to the team. If you are going as an NGO Observer, reading the transcripts gets you up to speed, both on the issues that may be on the docket during your observation and for understanding how the courtroom works. For example, in the February 2016 session Jay Connell, Learned Counsel, details the classified information process (pages 10332-10376). Perhaps most importantly, reading the transcripts prepares you with questions to ask the Prosecution and Defense teams. For example, does the manner in which the Prosecution approaches classifying information unreasonably delay the process or harm the defense team’s ability to represent the defendant? For the general public the transcripts are an easy way to stay informed about the process. Granted there are gaps when the sessions move to classified hearings, but reading the transcripts works for the most part. There are typically two responses when I tell people that I am going to Guantanamo Bay to observe the 9/11 hearings. The first is, “why is it not moving faster?” The second is, “why are we not trying the defendants in federal court in the U.S.?” Reading the transcripts answers both these questions. The Military Commission website hosts 195 transcripts for the 9/11 hearings all labeled as “unofficial/unauthenticated.” Usually I read the transcripts as soon as they are posted at the end of the day; but teaching two classes got in the way of this goal in February. At a minimum I like to download the transcripts as soon as possible. Why? — because sometimes the transcripts change–that is, content is redacted even though it occurred in open court. As Judge Pohl stated, the participants, be they defendants, judiciary, defense, prosecution, victims, or observers, didn’t make the military commission system, it is simply the system we have to work with and we all find our way to work best in it. Downloading and reading the transcripts is one of the ways I work with the system. NPR’s David Welna updates NPR listeners on Mohamedou Ould Slahi, a forever prisoner at Guantanamo Bay, and author of Guantanamo Diary. Written in long-hand, the book describes his nearly 14-year ordeal as a detainee at Guantanamo Bay. The US Government redacted much of the work and has prohibited the author from seeing a published print copy of his book. The story details the torture Mr. Slahi was subjected to at Guantanamo Bay and discusses the legal limbo he now resides in as a forever prisoner. Welna interviews Mr. Slahi’s attorney, Nancy Hollander, and others during the story. You can find the NPR story (and interviews) here. At the end of each week of the 9/11 hearings, there are a series of concluding media briefings at which the defense teams, the prosecution, and the families of the 9/11 victims speak to the members of the press who are present in Guantanamo Bay. This week the members of the media included representatives from news outlets, including among others, Associated Press, BreitBart News, BuzzFeed, and Law Dragon. Carol Rosenberg of the Miami Herald was present as well and is the only reporter that has attended all of the Military Commission hearings. The NGO Observers are not allowed to attend these press briefings but are allowed to view them via a live stream in the NGO Office Lounge. After Walter Ruiz, James Connell III, and David Nevin, defense attorneys, and Chief Prosecutor Brigadier General Mark Martins spoke, four of the Victims’ Family Members chose to speak to the media. It was apparent from their statements that each is on an individual journey. Phyllis Rodriguez spoke first. Her 31-year-old son Greg died in the attacks on the World Trade Center. She started by saying she was a 9/11 victim’s family member and as such she was a member of a “club no one wants to join.” Phyllis then went on to say that she had always opposed the death penalty, but that her conviction had not been tested before 9/11. Four days after the 9/11 attacks she and her husband Orlando Rodriguez wrote an open letter, “Not In Our Son’s Name,”calling on President Bush not to resort to a military retaliation against Afghanistan. The print version is here. As a result of the letter circulating on the internet along with several others by victims’ family members calling for non-violent solutions, they met others who held similar beliefs. From these connections, the non-profit September 11th Families for Peaceful Tomorrows was formed on February 14, 2002. The organization’s mission is stated on its website as follows: “an organization founded by family members of those killed on September 11th who have united to turn our grief into action for peace. By developing and advocating nonviolent options and actions in the pursuit of justice, we hope to break the cycles of violence engendered by war and terrorism. Acknowledging our common experience with all people affected by violence throughout the world, we work to create a safer and more peaceful world for everyone.” (Peaceful Tomorrows website). The organization has received numerous awards, including a Nobel Peace Prize nomination in 2004. In 2015 film maker Gayla Jamison produced and directed a documentary about the ongoing reconcilation work of Phyllis and Orlando Rodriguez. The film is entitled In Our Son’s Name. 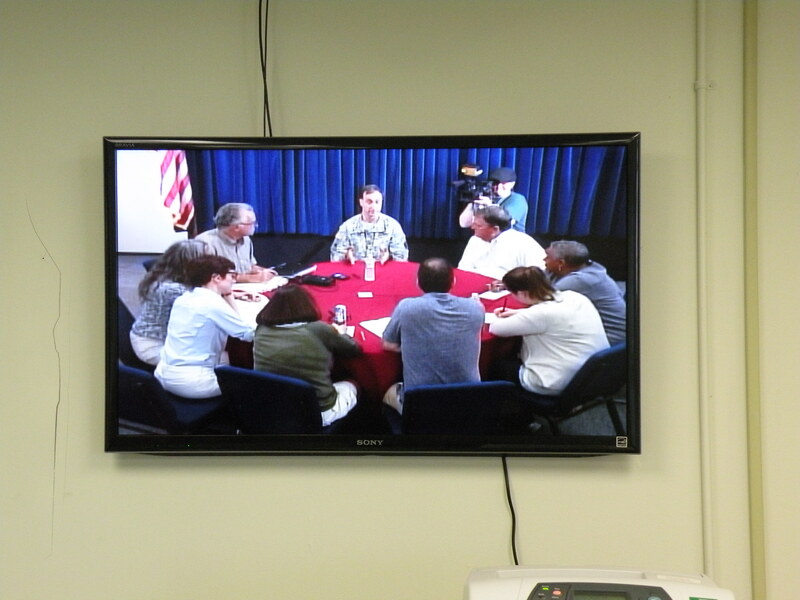 The press briefings are recorded and the video posted on the Military Commission site for public viewing. The December 11, 2015 briefing will be posted shortly. The words and stories of all the Victims’ Family Members are powerful reminders of the importance of making sure that the defendants are afforded fair and just proceedings by the Military Commission. Sunrise at Guantanamo Bay, awaiting ferry to the base airport. By: Catherine A. Lemmer, 9/11 Hearings, Guantanamo Bay, 11 December 2015. The 9/11 Hearings are recessed this morning (Wednesday, December 9) because Mr. Mustafa al Hawsawi did not voluntarily waive his right to be present at the proceedings. Mr. al Hawsawi was forced to choose between attendance at today’s Military Commission hearings or a meeting with the International Committee of the Red Cross. Under the Military Commission’s procedures in place here for the 9/11 proceedings, a defendant must attend the proceedings or voluntarily waive his right to attend. If a defendant chooses not to attend, but does not do so voluntarily, the Joint Task Force must “force” the defendant to come to the proceedings. Judge Pohl “sternly” advised the government that although he understands that there are “a lot of fingers in the pie” and “no unity of command” it is not acceptable to have these kinds of easily avoidable delays. The hearings are now in recess to permit Mr. al Hawsawi to attend his ICRC meeting this morning and then attend the hearings this afternoon. In the afternoon we are set to pick up with the female guard issue. There were no open hearings today, December 7, 2015, in the 9/11 case. The hearings were closed for a 505H hearing during which the prosecution, defense teams, and judge addressed a number of evidentiary issues. One of the on-going matters the parties discussed today was the use of female guards in the detention camps. The inmates object to the use of female guards for religious reasons. The court heard, during the open session in October 2015, extensive testimony and evidence on this issue. Despite that the court was in open session the transcript has been significantly redacted and is now labeled: “Unclassified For Public Use.” This means that the previously available information is now classified. For example, there is less than one page of transcript for the 11:16 AM to 12:28 PM session on October 30, 2015. All the transcripts are available on the Military Commission site. The unofficial word is that the female guard issue will be continued in the February 2016 hearings. Judge Pohl will hear additional classified evidence at that time. Until such time, the interim order will remain in place that prohibits female guards from interacting with the defendants for purposes of “legal activities.” For example, transporting the defendants to attorney meetings or to court. It is an order limited to legal matters, therefore the female guards are not prohibited from interacting with the defendants in such instances as escorting them to the recreation area or for matters other than legal. The unofficial word is that the Military Commission will conduct four days of hearings starting tomorrow morning. At that point Judge Pohl will engage in a colloquy with each defendant regarding his right to be present in the courtroom. This colloquy occurs each time the hearings are convened. As the NGO Observers were not able to be in the courtroom, we visited the Navel Exchange (NEX) for supplies. There was a huge Christmas display in the entrance to the NEX; many of the units decorate a Christmas tree. The Christmas tree pictured above features two local wildlife — the iguana and the banana rat. The NGO Observers were taken on a drive up on the windmill ridge. From there you could see the entire naval station. The JTF detention centers are on the other side of the island and off-limits to the NGO Observers. At the end of today’s (Saturday) 802 conference, we were informed that there will be no open hearings on Monday, December 7, 2015. The Defense teams, Prosecutor, and Judge will be conducting a 505H hearing to discuss evidentiary matters related to a number of motions. If Monday’s 505H hearing resolves some matters, we will start up on Tuesday with the female guard issue, the CIA interpreter on Mr. bin al Shibh’s team, and again the conflict of interest matters. I arrived at Andrews Air Force Base in the dark and am all checked in. I got my ticket and had a chance to read the Andrews Gazette while waiting for the rest of the NGO Observers to arrive. I’ve introduced myself to the other NGO Observers as they arrived and I’ve handed out the newest version of our Guantanamo Bay Fair Trial Manual. There are seven observers this time, representing law schools, human rights and other non-profit organizations, and the private bar. I look forward to sharing conversations and learning from them this week. The issues before the hearing this week are of great interest — classified information, the female guard issue, the CIA interpreter issue, and the continuing conflict-of-interest issues. 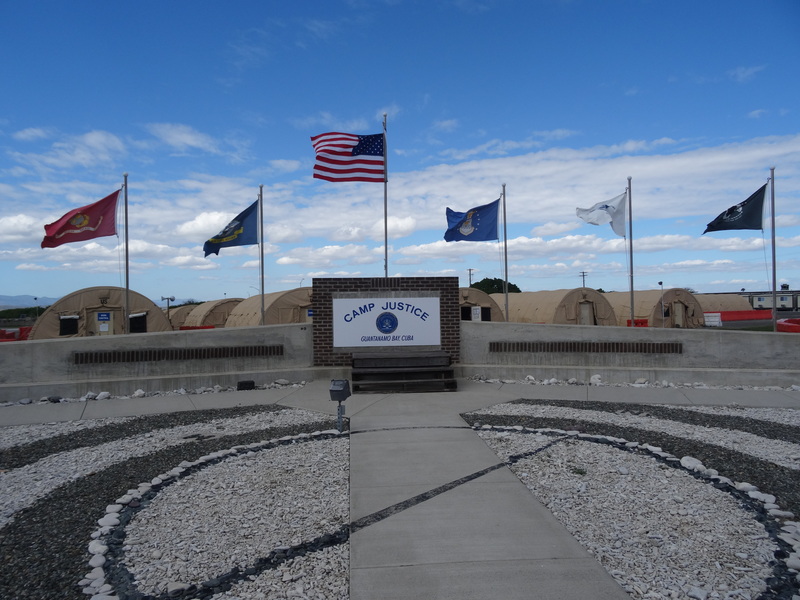 I was at Guantanamo Bay for the February 2015 9/11 hearings when the CIA interpreter issue stopped the hearings. I am very interested to see how that issue will be advanced. It will also be interesting to see if the recent move by the military to open all combat positions to women will have an impact on the discussion of the female guard issue. The chatter in the departure lounge is that the week is shaping up to be very productive. It is sure to be an interesting and informative week. The Inter-American Commission on Human Rights (IACHR) issued “Towards the Closure of Guantanamo.” The report, consisting of an executive summary and six chapters, reiterates the IACHR’s call to close Guantanamo. The report is available at the link above and below. To scroll, simply place your cursor anywhere on the document, there is no scroll bar. Note: there are numerous blank pages in the scrollable PDF document. Today, February 25, 2015, Chief Judge Colonel James Pohl, U.S. Army, ordered a halt to the case against the 9/11 defendants at Guantanamo Bay with his finding that Department of Defense officials tried to unlawfully influence the military commissions judiciary. You can read today’s ruling here on the Gitmo Observer. Judge Pohl ordered “abatement” of the case until the rule change is rescinded by the proper authority. The prosecution has five days to appeal the new order, if it chooses to do so. Judge Pohl ruled that the actions by the Deputy Secretary of Defense, acting upon the recommendations of the Convening Authority, constitute at least the appearance of an unlawful attempt to pressure the military judge to accelerate the pace of litigation and an improper attempt to usurp judicial discretion, thereby compromising the independence of the military judge. The ruling arises out of the December 9, 2014 memorandum of Major General Vaughn Ary, U.S.M.C. (Ret. ), the “Convening Authority” in charge of the military commissions at Guantanamo, to Deputy Secretary of Defense Robert Work asking him to require military commission judges to relocate to Guantanamo Bay “to accelerate the pace of litigation.” On January 7, 2015, the Deputy Secretary of Defense issued the rule change requested by the Major General Ary. On January 30, defendants in the 9/11 case filed a motion to dismiss the case for unlawful influence over the military judiciary. Judge Pohl ruled on their motion today. On Wednesday, February 11, Judge Pohl called for the parties to suggest motions that could be heard outside of the 292 conflict-of-interest matter and the prior CIA black site interpreter matter (350). There was an aura that the 9/11 hearings were on life support as the prosecution and defense struggled to put motions on the table that could be argued during the remainder of this week. Mr. Walter Ruiz, Learned Counsel, proposed a number of motions that deal only with his client, Mustafa al-Hawsawi. This morning he called to order the Military Commission to hear arguments on a variety of outstanding motions. Defendant Mr. al Baluchi chose not to attend the hearings today. As a result, the first few minutes of the proceedings dealt with an Officer of the Judge Advocate General Corp’s office testifying that he had informed Mr. al Baluchi of his rights to attend and to obtain his waiver. Typically when this happens the prosecution files a “submission of alias” because the testifying officer does not provide his name on the witness stand. Learned Counsel for Mr. al Baluchi, James Connell, noted on the record that the prosecution had not made such admission this morning. David Nevin, Learned Counsel for Khalid Shaikh Mohammed, again went on the record to make an on the record motion (and to indicate that he will be filing a written motion) to halt all proceedings until such time as the matter of the former CIA black site interpreter issue is resolved. Again, he was overruled. AE192 & AE196 Motion to Seek to Disqualify Legal Adviser, Office of the Military Commission Due to the Unlawful Interference with the Professional Judgment of the Chief Defense Counsel and Detailed Learned Military Counsel. Mr. Ruiz requested that Judge Pohl go forward with an analysis of the underlying facts and law because these circumstances are representative of an instance of unlawful influence in the proceedings. The issue of unlawful influence does not resolve itself simply because those involved have left the Office of the Military Commission. Ms. Bohrmann, Learned Counsel, for Mr. Walid bin Attash, similarly urged Judge Pohl to undertake the analysis and make a ruling. AE332 & AE340 Motions to compel discovery of Mr. Hawsawi’s medical records and access to medical personnel who treat Mr. Hawsawi. Mr. Ruiz requested access to medical records and medical personnel in order to judge the standard of care his client is receiving and also to help Mr. Hawsawi make medical decisions. His health has showed signs of deterioration. The prosecution challenged these motions by arguing that the medical issues are arising out of a December 2014 incident in which Mr. Hawsawi was injured while in detainment. The prosecution also stated that his medical records, which were classified, are being declassified and delivered to the defense on a rolling basis. AE214 & AE214A Motion to Compel Mr. Hawsawi Access to the Government of Saudi Arabia in Compliance with United States Law and Motion to Compel Prosecution to Produce Un-redacted Copies of Correspondence etc. Pertaining to Requests by Saudi Arabia to Meet With Its Citizens Held in Guantanamo Bay Mr. Ruiz urged Judge Pohl to order this discovery so that Mr. Hawsawi would have access to officials of his home state, Saudi Arabia. At the conclusion of lengthy oral arguments, Judge Pohl asked if there was any further outstanding matters. Again David Nevin renewed his concern that the legal proceedings were continuing in light of the 292 and 350 matters. James Harrington, Learned Counsel for Ramzi bin al Shibh, brought up what he called a “simmering problem.” He stated that the manner in which the defendants are handcuffed/shackled has changed and that as a result the defendants are experiencing injuries. Mr. Harrington noted that the defendants are not attending attorney-client meetings rather than suffer the injury. He asked Judge Pohl to ask the prosecution to look into the matter and see if the issue can be corrected. The proceedings concluded with James Connell, Learned Counsel, asking Judge Pohl to issue an subpoena or other relief to provide the defense access to the former CIA black site interpreter. Judge Pohl declined to do so and asked for a written motion. Opening statement by General Martins that the presence of a former CIA black site worker on a defense team “in no way resulted from any action by any agency of executive branch to gather information on any of the defense teams.” He repeated the statement twice before moving on. On the matter of the former CIA black site worker, Judge Pohl shut down defense counsel’s attempt to present a”preview” of the motions they will be filing in response to the government’s filing and General Martins’ opening statement. Defense counsel for all the teams argue that General Martins’ statement is a suggestion that defense counsel failed to adequately represent their clients because they, the defense counsel, did not discover the interpreter’s past history. Defense counsel David Nevin stated he wants to find out what purpose the interpreter was put on the defense team if it was not to have him gather information. Special Independent Counsel for Mr. Ramzi bin al Shibh, Lt. Col. Julie Pitvorek (USAF), stated that the defense teams can not move forward on the conflict-of-interest matter without additional information. Judge Pohl denied the Special Review Team’s request for a closed meeting with Special Independent Counsel and him. Defense counsel David Nevin objected at three different points to the continuation of the hearings until the interpreter issue can be investigated and resolved. His objections were overruled. After a short recess, Judge Pohl took up the matter of severing Ramzi bin al Shibh and the 292 motion series. Judge Pohl started by pressuring the prosecution to indicate “how long was too long.” In short how long would the government oppose severance knowing it would hold up the trial of the other four defendants. The government remains opposed to severance. Judge Pohl called a long lunch recess to allow the lawyers to deal with the interpreter and severance issues. We will resume at 2:00 pm. Monday, February 9, was my first observation experience in the Guantanamo Bay courtroom. It is difficult to describe because I am prohibited from writing much of what I would like to say about the activities in the courtroom. It is a highly controlled area. A sign informs observers that among other things, sketching and even doodling, are prohibited in the gallery. After seeing the courtroom activity, I believe even more so that the courtroom proceedings should be broadcast live on C-SPAN or other network. Observers, along with the media, are seated in a four-row gallery behind a glass window. Upon entering the gallery you are given an assigned seat number. Media representatives, along with the court sketch artist, are assigned to the front row. Media may also watch the courtroom action on a direct feed to their office/lounge. This allows them to send immediate updates. There is a special gallery section for the family members of 9/11 victims. A curtain can be drawn to protect the victim family members from view of others in the event there is a need for privacy. The defendants are able to see into the gallery; and at one point Khalid Sheihk Mohammed looked back and acknowledged one of his pro bono attorneys who was present in the gallery. The gallery is on a 40-second delay. It is amazing how long 40 seconds feels! The time delay gets a bit weird when the “all rise” is given when Judge Pohl leaves and the gallery is still processing the last minute of the activity. I was standing and still scribbling notes as I watched the monitor. There are a lot of actions that seem unnecessarily proscribed at Guantanamo Bay. For example, the NGO Observer office/lounge is in the old airport hangar, as is the media’s office/lounge. However, we enter our NGO Observer office/lounge from a door on the outside of the building and can’t go into the hangar. During General Martins’ press briefing, the NGO Observers could not go into the hangar and watch. We had to stay in our office/lounge and watch it via a live link. Similarly the NGO Observers had to watch the defense team press briefing in our NGO Observer lounge/office. The feed to the NGO Observer lounge/office was terminated at the end of the hour, even though the press asked the defense teams if they would continue with the briefing. The NGO Observers later learned that the questions and answers continued for some time after the feed was terminated. After the startling allegations against the newly assigned interpreter by Ramzi bin al Shibh, one NGO observer remarked “you just can’t make this stuff up!” That about sums up the process here at Guantanamo Bay. On Monday, February 9, Judge Pohl recessed the 9/11 hearings to permit General Martins’ prosecution team and the defense teams to investigate the allegations made by the 9/11 defendant, Ramzi bin al Shibh, that he recognized the new interpreter assigned to his defense team as a worker at a CIA black site. Interestingly, his statement naming the individual and directly making reference to a CIA black site was not censored by the Courtroom Security Officer. As a result, the unofficial transcript first posted to the Military Commissions site included the interpreter’s name. Later in the afternoon a redacted unofficial transcript was posted. A number of the NGO Observers felt that the inclusion of the interpreter’s name in a public document was unwise. General Martins asked for time to discover the facts and file “papers.” Defense teams asked that the filings be adversarial (ie., available to the defense) rather than ex parte. In addition, defense teams asked that the interpreter be made available for interviews. There has been a good deal of going and coming of lawyers at the courtroom. However, no news is leaking out to the NGO Observers. It is now 6:30 pm on Tuesday and the docket does not specifically reflect any filings by the prosecution or the defense on this matter. The prosecution did file an “Unclassified Notice of Classified Filing” earlier today. The document is not available for public review. Although there is much speculation as to whether the 9/11 hearings will move forward, there is no news as of this time. The 9/11 hearings at Guantanamo Bay were recessed until 9:00 am Wednesday, February 11 to give the defense and prosecution teams to investigate the defense team interpreter accused of being a CIA black site worker. Today’s action started with a request by retiring Navy Lieutenant Commander Kevin Bogucki to resign from the defense team for Ramzi bin al Shibh. When asked if he accepted Major Elena Wichner as new counsel, Mr. bin al Shibh stated that he could not trust the defense team interpreter sitting next to him because he recognized him as CIA black site worker that was involved in the CIA Rendition, Detention and Interrogation program. Cheryl Bohrmann, Learned Counsel for Walid bin Attash, stated her client had informed her of the same just minutes before. Ironically the interpreter alleged to be a CIA black site worker replaced the individual dismissed from Mr. bin al Shibh’s team who was found to be the FBI infiltrator. After a brief recess to bring in General Martin’s prosecution team, Judge Pohl asked the prosecution and defense for a “way forward.” General Martin’s asked for time to investigate and make filings. David Nevin, Learned Counsel for Khalid Sheikh Mohammad, requested that the Military Commission require the dismissed interpreter be held on the island and made available for interviews with the defense. Cheryl Bohrmann inquired of Judge Pohl if General Martins’ prosecution team was the best option for the investigation of what might again be the government’s infiltration of the defense teams. She noted that her client, Mr. bin Attash, was “visibly shaken” and suggested the the Special Review Team already in place to investigate the FBI conflict-of-interest matter should be used. Judge Pohl chose to rely on the prosecution and indicated that he didn’t intend that this matter would go through the usual three-week briefing schedule. The hearings are recessed until Wednesday, February 11. The 9/11 hearings are in recess because defendant Ramzi bin al Shibh alleged in the courtroom that the interpreter at his defense table had been at a CIA black site. Defense counsel for Walid bin Attash, Cheryl Borhmann, then indicated that her client had informed her of the same. Court is in recess until 10:30 am. General Martins’ prosecution team has been called to court to deal with the issue. His team was not in court because the Special Review Team was representing the government on the FBI conflict of interest matter. 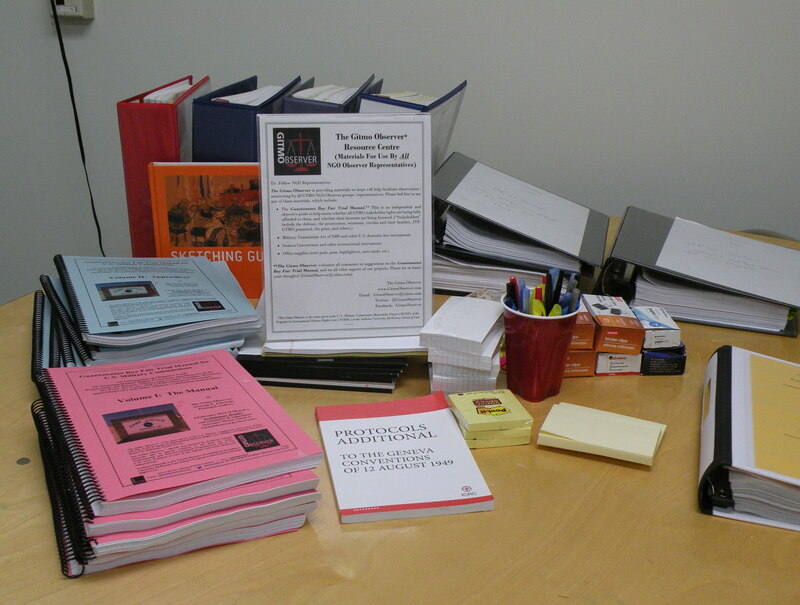 The remaining copies of the Guantanamo Bay Fair Trial Manual and other resources and supplies are set up in the NGO Observer lounge and ready for use by the NGO Observers. This trip has nine NGO Observers. The NGO Observers represent the law schools of Duke University, Seton Hall, and Georgetown University. The other NGO Observers represent Amnesty International, National Institute for Military Justice, New York City Bar Association, Judicial Watch, and Pacific Council on International Policy. Everyone has been uniformly impressed by the Guantanamo Bay Fair Trial Manual. Hopefully we will get some good feedback! Earlier today the prosecutor provided the updated 9/11 court filings on cds. They also provided two dvd/cd drives for those NGO Observers whose laptops no longer have dvd/cd drives! Technology sure has a way of complicating things on days. 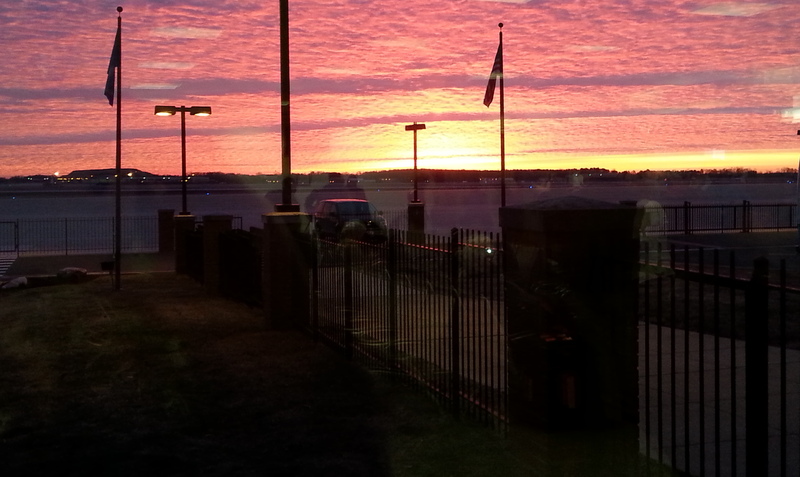 The sun is on the horizon and the departure lounge at Andrews Air Force Base has started to fill up. The wall outlets are in demand; and the wifi is slowing down. The nine NGO Observers are all here as we are the first to check-in. I have already distributed copies of the Guantanamo Bay Fair Trial Manual — everyone is most appreciative! One NGO Observer had already downloaded it from the link I sent in yesterday’s introductory email. As soon as I finish this post I am off to continue conversatio n with some of the defense lawyers and members of the media.